Shalini Bhutani takes a close look at the law and ensuing policy on trade in India, and asks whether the regulatory framework on trade issues nurtures the idea of public consultation. The World Trade Organisation (WTO) completed twenty years in 2015. Its Tenth Ministerial Conference will be held in Nairobi, Kenya from 15-18 December 2015. In the coming weeks, the official process of preparation will commence. Before departure of the official Indian delegation to Africa there might be consultations with hand-picked experts, industry associations and select non-government organisations. The WTO itself is to host a Public Forum through 30 September to 2 October 2015, to mark its twentieth anniversary. But within a sovereign democratic republic and member-country of the WTO such as India, how far does the system facilitate citizens’ participation in trade decisions? Let us for the moment hark back to the days of 1992. 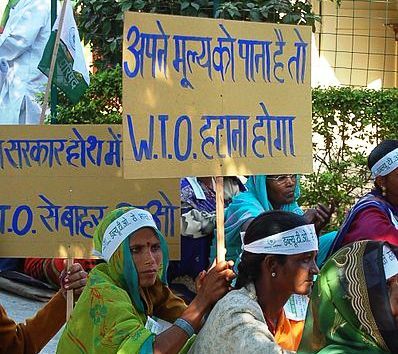 That year is remembered in India for the days of street action against the proposed WTO and its agreements. The same year, a domestic law for trade was passed. Yet there is an apparent lack of awareness about the law that enables the country to both import from and export to the world at large. This cross-border trade is undertaken through the Foreign Trade (Development and Regulation), hereinafter referred to as the FT (D&R) Act 1992, to be read with its implementing Rules and Order of 1993. As per the Constitution of India, ‘trade and commerce with foreign countries, as well as import and export across custom frontiers,’ are matters on the Union List (Entry 41). However, a lot of sectors directly impacted by such trade, such as agriculture, fall under the State List. Trade matters are never only about trade. Even before the Constitution came into force, with India’s independence the Imports and Exports (Control) Act, 1947 was passed. Under this Act, the Central Government regulated imports through the Imports (Control) Order, 1955. Similarly, an Export (Control) Order was in force from 1988 to 1991. These were repealed by the FT (D&R) Act, 1992. The Act was passed soon after the Industrial Policy Resolution of 1991, which is seen as the starting point for the rollout of economic ‘reforms’ in India. Thus the FT (D&R) Act came into force even before India became a member of the WTO in 1995. Nonetheless, as mentioned above, 1992 was a time when popular protests and farmers’ rallies against the ‘Dunkel Draft Text’ proposed by the then Director General of the GATT – Arthur Dunkel, were at their peak. Civil society that directed its ire at the text of the proposed WTO and its agreements perhaps didn’t pay as much attention to the text of the FT (D&R) Act itself. As per the Act of 1992, the office of the Director General of Foreign Trade (DGFT) under the Commerce Ministry carries out the executive functions for the Act. These are further detailed in the Rules, 1993. Only a person granted an Importer-Exporter Code (IEC) Number by the DGFT can carry out trans-boundary trade, though there are exemptions from the IEC for ministries/government departments and diplomats. While the focus of the FT (D&R) Act had initially been on trade in goods, the Act was amended in 2009 to include both ‘technology’ and ‘services’.The Amendment Bill was introduced in the Rajya Sabha on 25 November 2009 and was referred to the department-related Parliamentary Standing Committee on Commerce. The process by default, and not by design, created an opportunity for public consultation. The Standing Committee under chairperson Shanta Kumar held a series of meetings through January-March 2010 on the Bill, preceding which the text of the proposed amendments was made public to receive comments. However, records show that most of the feedback came from the Confederation of Indian Industry, Federation of Indian Chamber of Commerce and Industry, Federation of Indian Exports Organisation, Federation of Indian Micro and Small & Medium Enterprises, PHD Chambers of Commerce and Industry, All India Association of Industries, etc. Subsequently, the report of the committee on the Amendment Bill was presented to relevant officials of both houses of Parliament in March 2010. What the country allows or prohibits to be imported is a decision closely linked to its industrial policy. In line with the policy decision to ‘open up’ the Indian economy to the world, the FT (D&R) Act was passed to facilitate imports and augment exports. This, in part, also explains why the EXIM Policy of 1992-1997 dismantled various protectionist policies, with an eye on integration with the global economy. The Act (Section 5) gives power to the central government to formulate, announce and if need be amend, the export and import policy of the country. The current Foreign Trade Policy (FTP) 2015-2020 came into force on 1 April 2015. This, again, is very much in line with the industrial and fiscal policies of the central government. The policy is premised on an export-led growth model; that is why we have the handholding for new entrepreneurs by the DGFT under the Niryat Bandhu Scheme. The FTP is also supportive of the Make In India (MII) initiative. Therefore, it introduces a new scheme, namely the Merchandise Exports from India Scheme (MEIS). Likewise, the Services Exports from India Scheme (SEIS) is in sync with the government’s objective to augment trade in services. The DGFT has been given the power, to be exercised in public interest, to pass any orders or grant such exemption, relaxation or relief as he may deem fit and proper, on grounds of genuine hardship and adverse impact of trade on any person or class or category of persons from any provision of the FTP. The FTP expressly states that the DGFT is committed to easy and speedy redress of grievances from trade and industry. The policy also provides an opportunity for personal hearing as a last resort to redress grievances of importers/exporters but there are no such provisions for the ordinary citizen. The DGFT itself, however, has a Citizen’s Charter that makes it clear who its clients are: all producers and consumers of goods and services in general and exporters and importers in particular. The FT (D&R) Act has no mandatory provisions for public consultation. In the absence of a legal obligation to do so, it is left to the government of the day to decide whether or not to carry out such consultations. Even in practice, seeking comments from the general public has not been made the norm in official trade circles. Moreover, the law grants immunity to government officials for any action taken in good faith (Section 18). According to the relevant legal provision, no order can be called to question in a court of law, nor can any civil suit lie against any person under this Act. So far the Right to Information (RTI) Act, 2005 has been the one legal recourse for concerned citizens to gain an inside view of trade negotiations. But this has also not always met with success, particularly when the information sought relates to draft texts of treaties. As trade agreements have implications for ordinary citizens in every aspect of their lives, it is only wise for a mature democracy to respond with mechanisms that enable them to speak freely about such agreements, and even more so be heard. The nature of consultation too will need to expand beyond simply seeking public inputs on model texts for new trade agreements, which essentially all remain within the ‘free’ trade paradigm. Given that trade has a defining impact on people’s basic needs such as food, health and employment, the debates might get more cantankerous than constructive. The official position taken by the Ministry of Commerce and Industry is not always motivated by the concerns of ordinary people. The last WTO OMC in Bali, Indonesia in December 2013 showed how people’s groups had to make their voices heard when WTO’s trade rules threatened public stockholding for food security. If the social, ecological and political impacts of trade are to be addressed, then governments will have to find ways to keep the dialogue up with its own people. Else, mainstream indicators for export performance or trade balance will point limitedly only to the economic impacts. To make a start, if the Government of India were to host a public forum on how India’s ordinary people have gained or lost from the twenty years of WTO, India’s trade negotiators would get both evidence from the ground and popular backing to question injustices in the global trading system. Free voices can help address the challenges of ‘free’ trade. People can say what governments cannot when confronted with rule-making on trade by other stronger countries and corporates, which are beyond their control. The author is a legal researcher and policy analyst based in New Delhi.